It’s as evocative of the ocean as anything we’ve seen, a dive watch with an all-blue ceramic case – but the new Blancpain Bathyscaphe Flyback Chronograph “Blancpain Ocean Commitment II” [BOC] ain’t no fashion diver, it’s the real deal and here’s why. 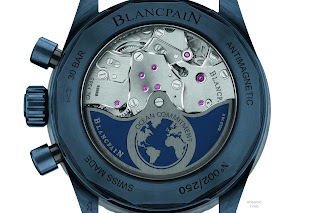 After extensive experimentation that lasted several years, Blancpain’s R&D department have finally been able to create an intensely blue colored ceramic case by adding pigments during the ceramic production process, together with a binding agent – okay, no drama’s so far. 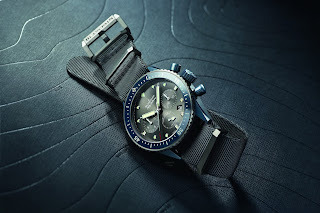 In order to obtain the watch’s stunning (and it is stunning) uniform, long-lasting blue hue throughout the entire case, two techniques were used; the first of which is a compaction process, where ceramic in powder form is pressed into a mold to obtain its shape. The second technique involved using an injection process to insert ceramic in the form of granules into the mold. This step enables the creation of a form in the final shape. After this, the piece is placed in an oven on a low temperature in order to slowly bake-off any remaining bonding agent. When this is done, the piece is heated at a high temperature – a phase known as sintering – in order to give the ceramic its ultimate hardness. Lastly, the machining and finishing operations take place in order to provide the geometry and final look of each part. The compacting process was used for the mid-case, caseback, bezel and chapter-ring insert. The second technique involving the injection method was adopted for the crown and chrono-pushers. The new Flyback Chronograph BOC II is powered by an F385 caliber beating at 36,000 vibrations per hour (5 Hz), the perfect frequency for a chronograph as it allows each second to be divided into intervals of a tenth of a second. The flyback chronograph is driven by a column-wheel. The F385 has a variable-inertia balance with gold screws, ensuring increased robustness and more precise adjustment than the usual index device. 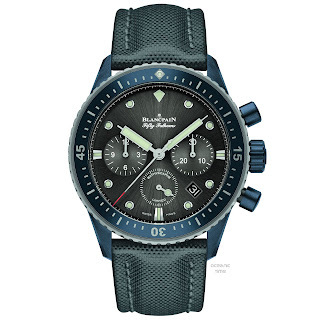 This has a vertical clutch that ensures faultless operation of the chronograph and eliminates any unexpected jerking of the watch hand when the chronograph is engaged. This also allows the chronograph mechanism to operate freely without having to worry about any negative effect on the watch’s rate accuracy. 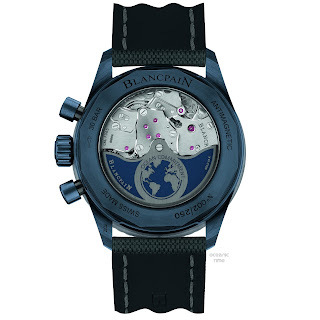 In addition, like all recent movements made by the Blancpain Manufacture, this caliber is equipped with a Si silicon balance-spring. 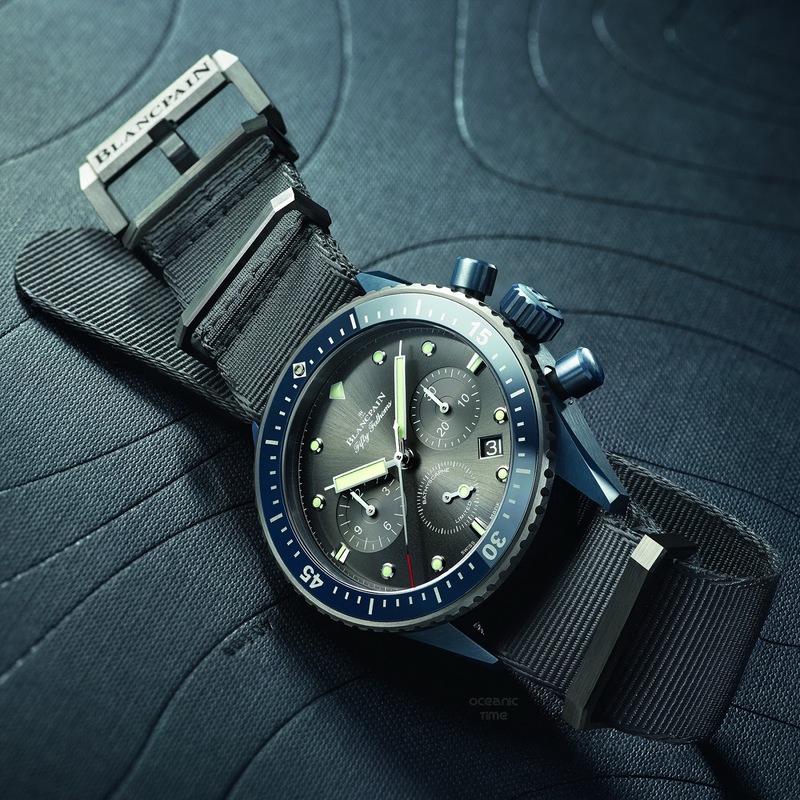 The Flyback Chronograph BOC II incorporates all the technical characteristics of a mechanical dive watch. 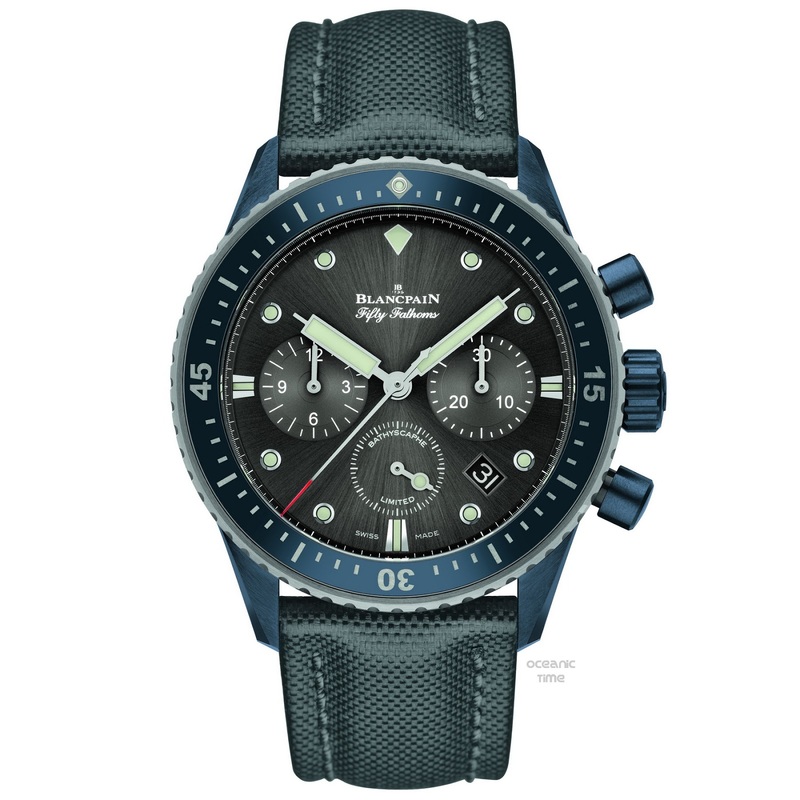 It is water-resistant to 300 meters and its unidirectional divers bezel features a gray insert and markers in Liquidmetal. 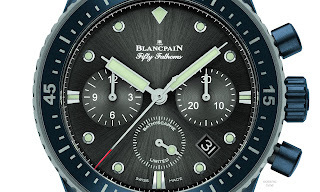 As well as this, it has a flyback function that enables immediate resetting of the chronograph to zero or restarting simply by pressing a pusher at 4 o’clock, in contrast to standard chronographs which require three steps to time successive events. This 250-piece limited-edition watch is further distinguished by its rotor which has been engraved with the words "Ocean Commitment” linking it to Blancpain’s commitment to the exploration and preservation of the oceans, while the Sapphire crystal caseback also reveals the watch’s sporty and sophisticated bridges. For each timepiece sold in this 250-piece limited edition, an amount of 1000 Euro will be donated in support of scientific expeditions. 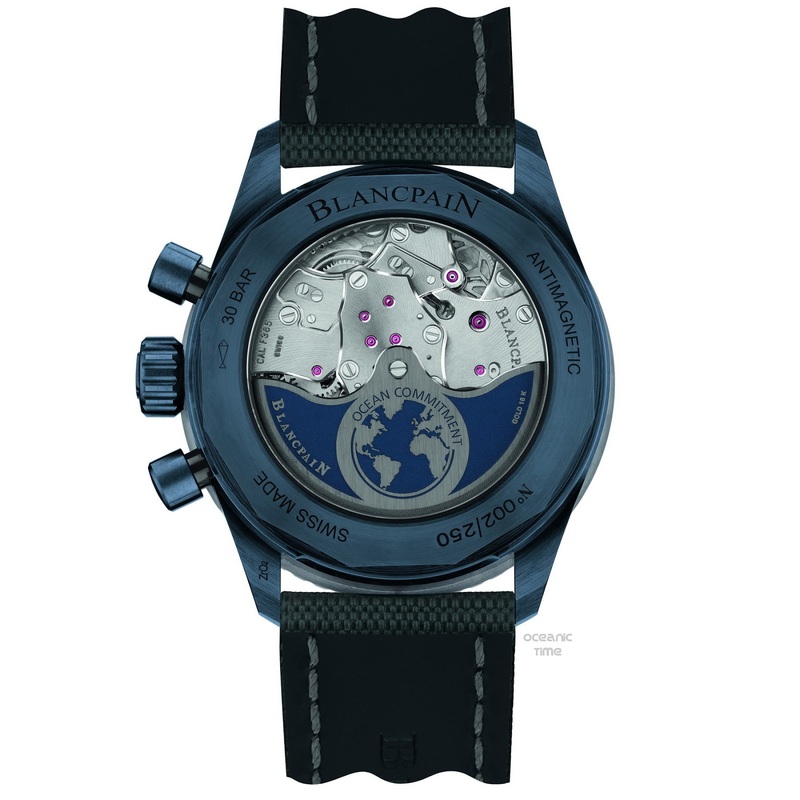 The 250,000 Euro resulting from this will be added to Blancpain’s contributions in support of the oceans. Not a fan of blue? Check out the Fifty Fathoms Bathyscaphe GRAY Plasma Ceramic.